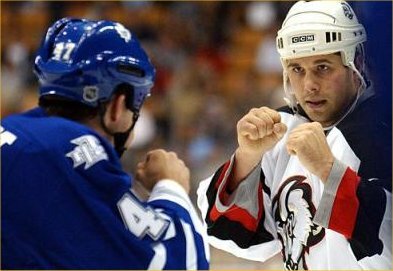 Fighting in Hockey…..Not For Me…..
Well then Mr. Cherry….call me cuckoo. I am old school when it comes to the game. I appreciate the finesse of a good hockey contest more than anything. Beautiful stick-handling, ultra fast skating and 100 mph slap-shots. That’s what I love to see. I like to see the game the way it was meant to be played. Throw in some heavy checks against the boards, solid goal-tending and some of the best athletes on the planet, and you have a Saturday night in front of the TV set at the Walder residence. There are a majority of fans out there who see the game in a different light. It’s a tough mans sports. Blood, Sweat and Tears personified. They are correct in that respect. It entitles intense play and a level of physicality only seen in football. But some of those fans are the same kinds of people who will sit in the stands or in front of their television sets and cheer on and encourage players when they drop their gloves and start beating the crap out of each other on the ice. That is where me and those fans will differ. I don’t mind a good fight. I love the UFC, Pro Wrestling and Boxing. The major difference is that those kinds of fights are regulated. There are rules, guidelines and most important of all……there is a reason for the violence. That is how you win. You have to physically incapacitate your opponent to succeed. So why fight in Hockey? There is no legitimate reason for it. Someone gives you a dirty look, or knocks you a little to hard against the boards, and that’s what sets you off? You don’t see that in any other sports. Football players tackle each other into the ground play to play, but you don’t see them taking off their helmets, pulling off their gloves and start swinging at each other. The funny thing is that you mainly see fighting in regular season hockey. When the playoffs, Stanley Cup and Olympics are under way, you rarely see players drop the gloves. Do they suffer because there is little fighting? Absolutely not. That is when the best players in the world showcase their talents for the ultimate prize. Why can’t it be like that all year round? I’ll take a hat trick over a hockey fight 10 out of 10 times. The NHL has become very worried about safety and the protection of their players over the last year. They are doing well so far by trying to eliminate the shots to the head that take out players for prolonged periods of time. We are living in an era where concussions are a huge problem and issue, and protecting players from getting knocked in the head is more important than ever. So why does the league allow its players to bare-knuckle box each other in the face every time they have a dispute? I’m sure that doesn’t help the issue, now does it? It gives the wrong impression to young children and teens who are playing in Minor hockey leagues and just starting to get a feel and love for the game. They see players in the NHL dealing with bad situations in a physical brutal manner, then that is what they believe they should do. Hockey is a game of skill and should be treated as such. If you want to go punch someone in the face, then take up boxing. The only way I see fighting in Hockey being abolished from the game is if someone dies. I know it may seem a little extreme, but it can happen. Someone takes a bad shot to the head and they drop dead. It wouldn’t be the first time that has happened in this world of ours. Don’t expect fighting to be removed anytime soon though. It is woven into the fabric of the DNA of Hockey. The NHL knows that if it were to remove fighting, then it would isolate a good portion of the fan base. The league can’t afford to do that. It isn’t like fighting is encouraged anyways. It does get penalized. I just don’t understand it as a component of the game, since it accomplishes nothing in my eyes. * I am in no way trying to push my opinion on to others. I am not Don Cherry, and that is not a shot at the Canadian icon. I respect those who believe that fighting is a part of the game.. Hockey is a physical sport, and that is where checking comes into the equation. As long as the checks are not deliberate and to the head, then there is nothing wrong with it. I personally just don’t see the need for a hockey fight. It adds nothing to the game but excite fans who love the bloodshed and violence.